If you followed Spirits of Life CAL you were probably waiting for a bonus pattern to be released. There was a small metal hoop included in official Scheepjes kits, and you were all wondering what it was for. And today is the reveal day! 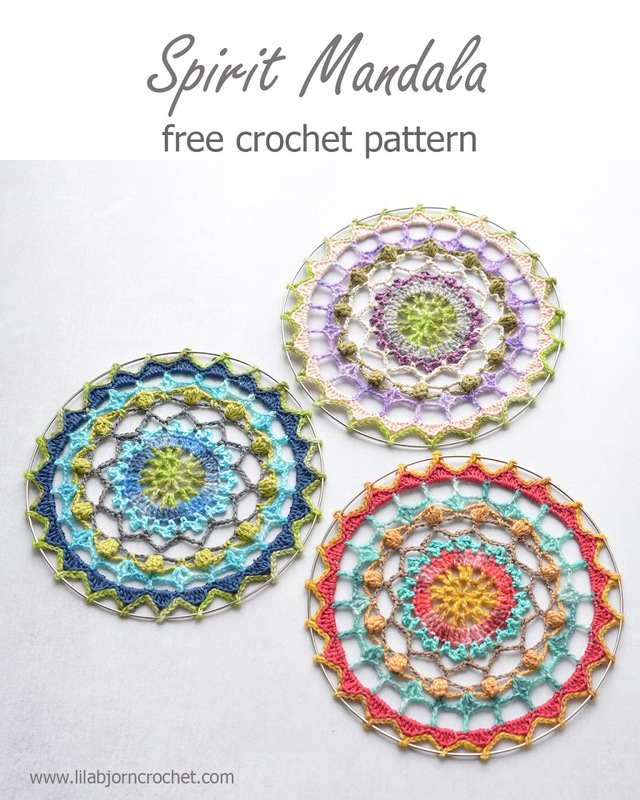 And the free crochet pattern day as well. This pattern was scheduled for an early January, but everyone was celebrating holidays (including translating teams). And I only started to receive translations now. Not all of them are ready yet. But missing files should be added very soon. So what was the metal ring/hoop for? I know many of you were guessing it could be a dream catcher. But it’s not. 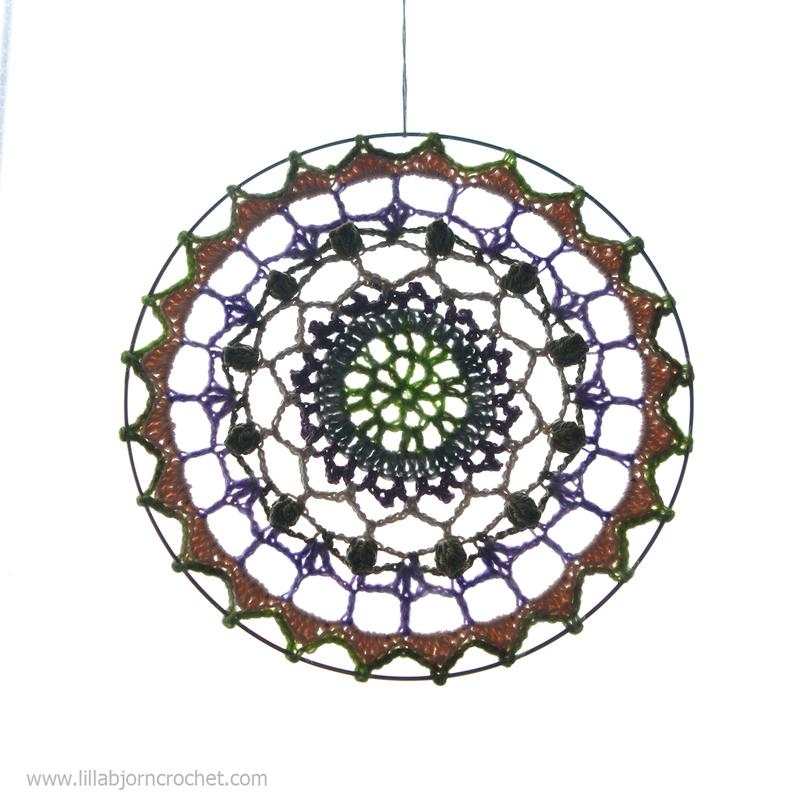 :) It’s just a small mandala wall hanging. If you have lots of yarn left, you can add some crocheted feathers, and beads. 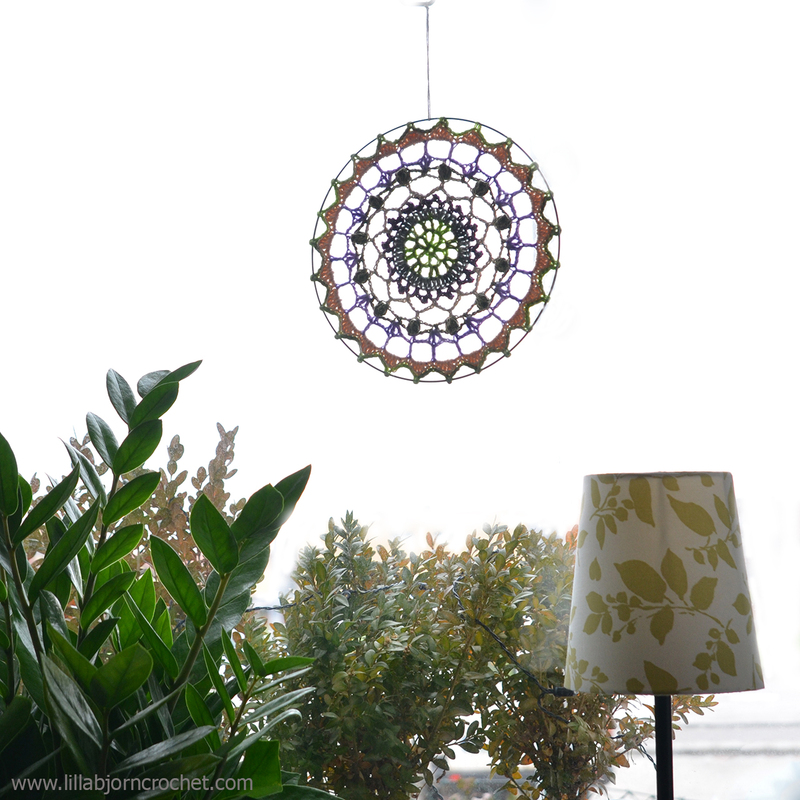 And turn your mandala into a kind of a dream catcher. That’s absolutely up to you. Spirit Mandala is very simple and is worked up really fast. No intricate stitches were used here, but you have a chance to practice popcorns. 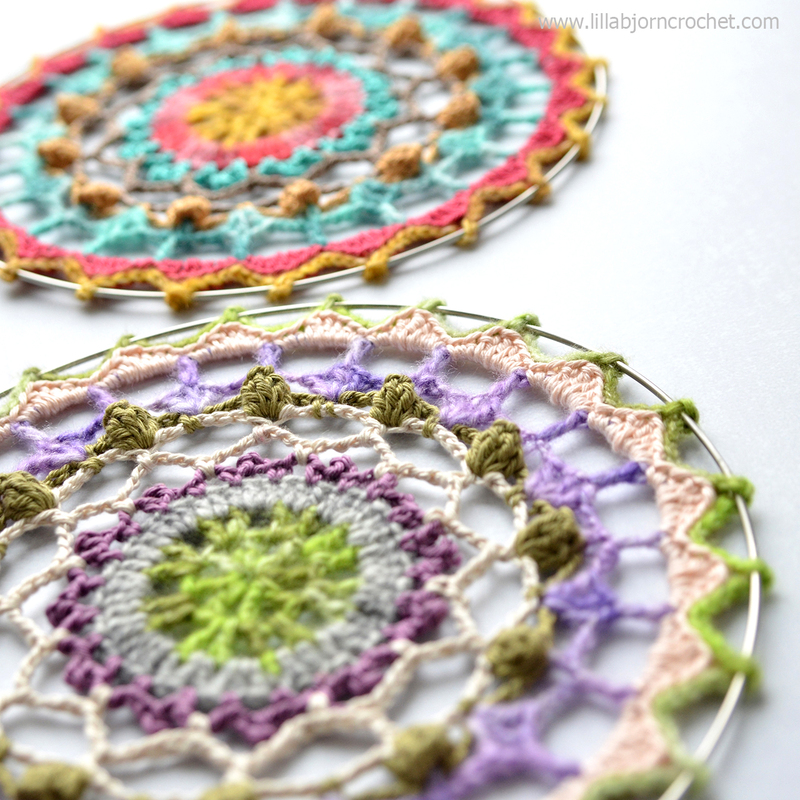 I recommend to use 3.25mm Amour Clover crochet hook but you may want to use a smaller one (or crochet tight) to make your mandala match the size of the hoop. I mixed both Spirit and Catona yarns for a faded effect. And I’ve completed all three mandalas. One of them found its place in my window. IMPORTANT: Please, be aware that all my patterns (free or paid) are protected by copyright. You are not allowed to copy, reproduce, redistribute (online or off-line), sell and edit them in part or as a whole. You are welcome to sell your finished items made by my patterns, but you cannot use my pictures to promote them. Please, always credit me as the designer of these patterns. You are not allowed to share pdf-files created from my posts with anyone. If you would like more people to join my CAL – please, share a link to my blog with them. You can check Copyright page for more information. My wonderful testers Hilde Tindlund, Cindy Douglass, Lori Baran, Kathy Mant and Susan Cutler Cutrer, who spent lots of time searching for errors and helping to polish the pattern. Massiel Lago and all amazing translating teams!! I can’t name everyone but I know that more than 40 people were working to bring translations of this CAL to life! Nikki Willis and other admins of Official CCC Social group on Facebook who were always in touch trying to answer all the questions and help you out. 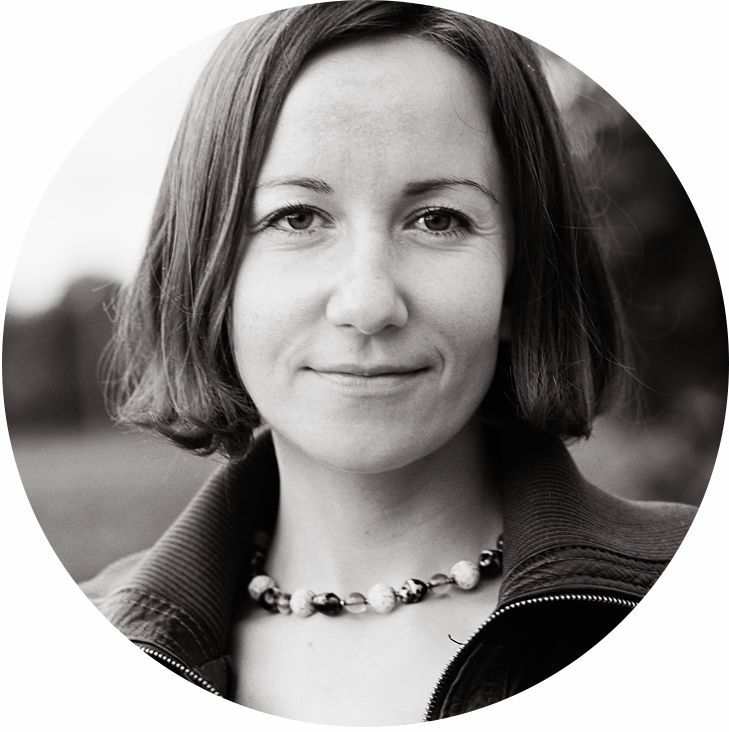 Esther Dijkstra of It’s All In A Nutshell whi inspired me to choose yarns for this CAL and who taught me how to create and upload video’s. Thanks to Esther I have my own YouTube channel now! My Scheepjes bloggers friends (Our Tribe) for support and inspiration. And of course I would like to thank all of you who joined me for this adventure. Who didn’t give up, managed to break through jungles of crochet techniques. And who finished their Spirit of Life wraps. 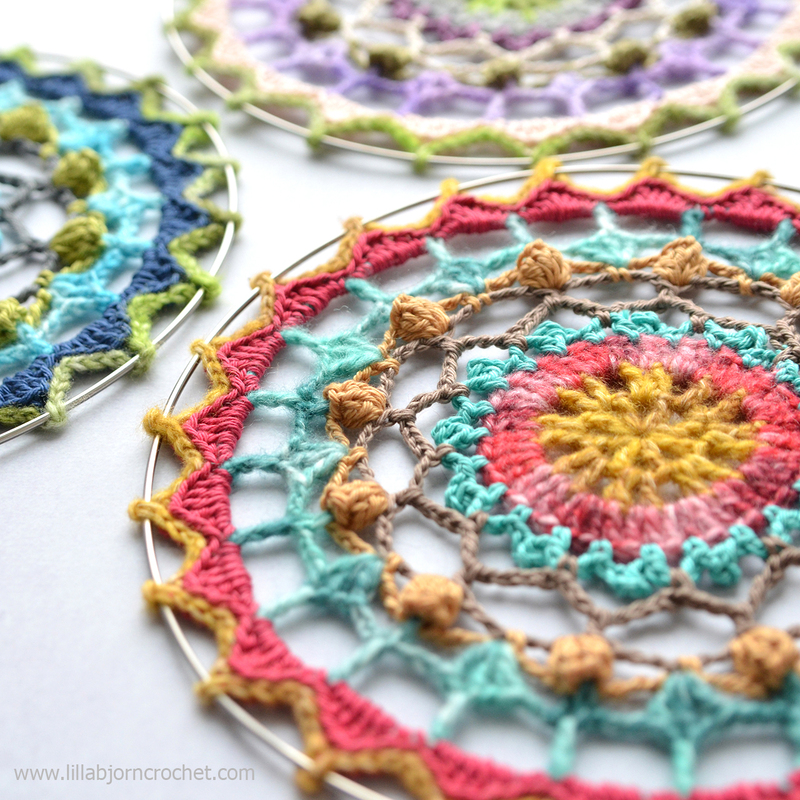 I hope you will enjoy the mandala pattern. And if you still have lots of yarn left you can probably make a matching pillow in C2C technique. Check my tutorial HERE. This bonus pattern is delightful, thank you. Your generous and creative spirit has shown through during this CAL. I look forward to more of your designs! Thank oyu for the bonus patterns. Unfortunately, this video and other Lilla Bjorn Crochet videos do not have sound. Hello, all my videos are silent. Far not everyone speaks English and I have other personal reasons not to add the sound. Instead I am trying to explain everything with a "crochet language". I like it. All your videos are wonderful. My hoop is 20cm across. Great pattern with easy to follow instructions, pictures, and video. I'm making the first of many dream catchers. Thank you! In just wish to thank you for the beautiful Mandala pattern. 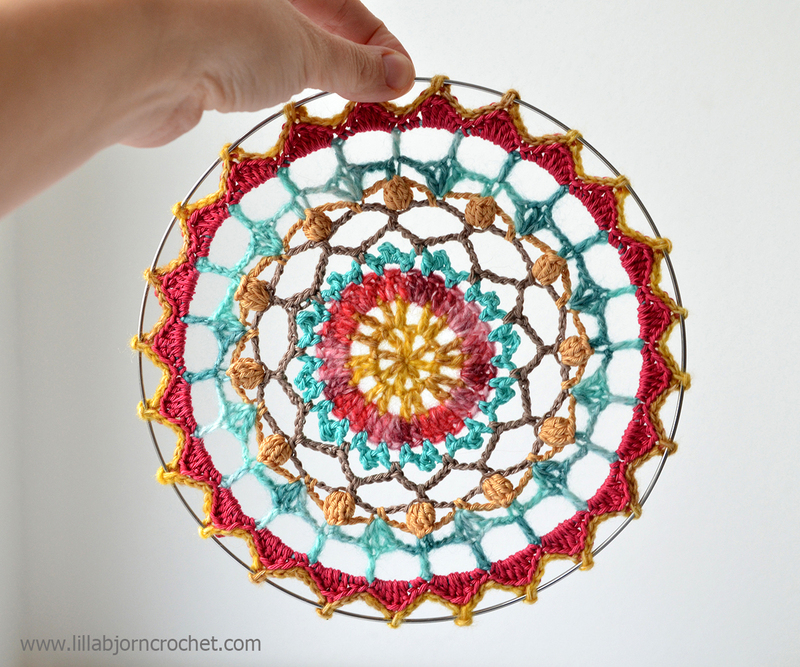 I am rather newish at crochet and this is an achievable project for me to do. You are truly inspirational. Thankyou. thank you for finding time to tell me this. this is very nice of you :) Please, check other patterns on my blog. Many of them are doable by beginners. Are you asking about this particular mandala? If you scroll up a bit, you'll see links to different languages. Choose the language you need and clock the link. You'll be brought to a pdf file with the pattern.